Tasked with a simple referral card for an influencer box, I knew I had to set up our game in order to stand out from the other products that were going to be included in the August/September edition of BabbleBoxx. The themed for the box was back to school, Shipt fit nicely into the box as our service of delivery in one hour or less, helps parents save time by eliminating grocery shopping or back to school shopping. While working with our copywriter, two out of the box ideas emerged. 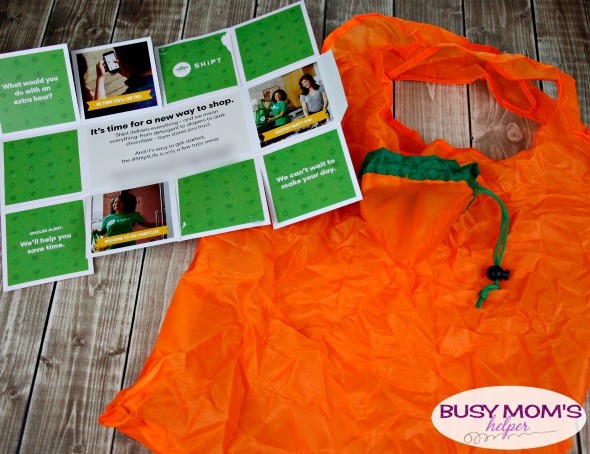 The first was an miniature grocery bag with cut outs of different items that can be ordered through our app. Given the small quantity needed this option was too expensive. The second idea was a box that unfolded to reveal a gift. 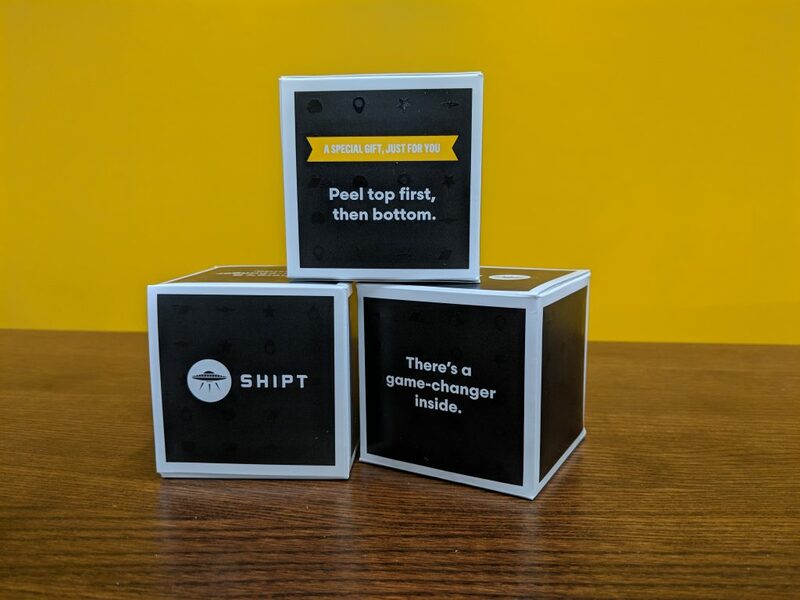 As the influencer unfolds the box they learn more about Shipt and how Shipt can help save them time. The small gift that was included was a small reusable bag that was shaped as a fruit or vegetable. For this project, I created a special di-cut template and tested the mechanics and printing of the box. 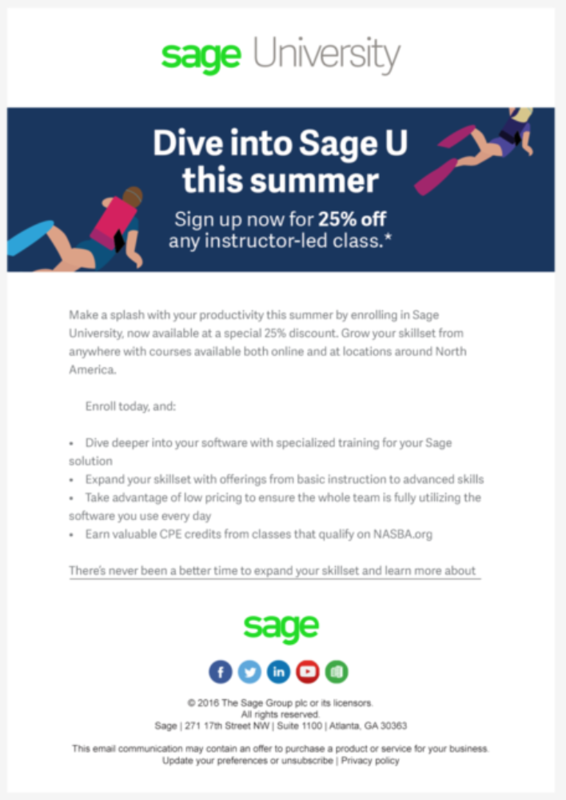 This campaign was designed to help drive Q4 revenue by getting customers to sign up for live training on Sage University. The theme was dive in. This campaign was successful and helped meet sales goals in Q4. The success of the campaign was tracked with the DIVEIN promo code. Just Poke is a newly opened poke shop in Bellevue and Kirkland. 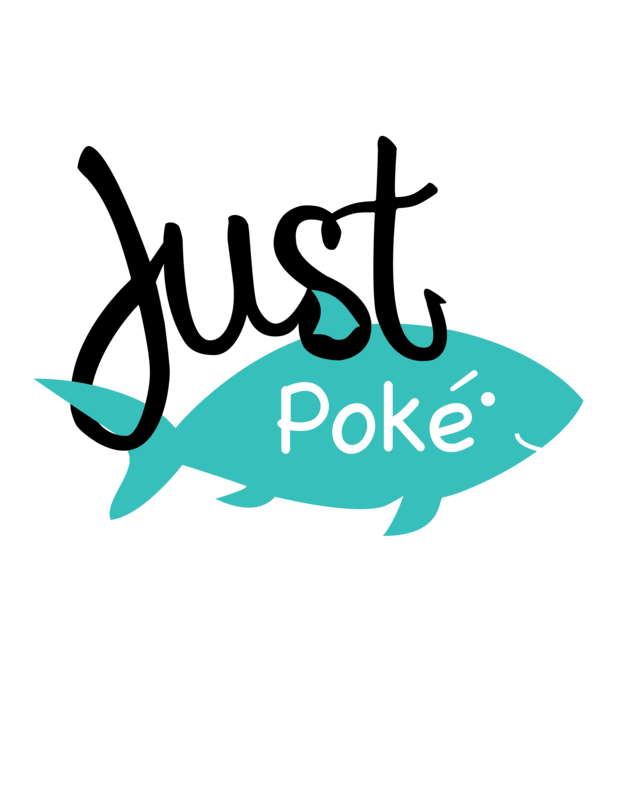 They are dedicated to providing locally and sustainably sourced and fresh poke bowls. 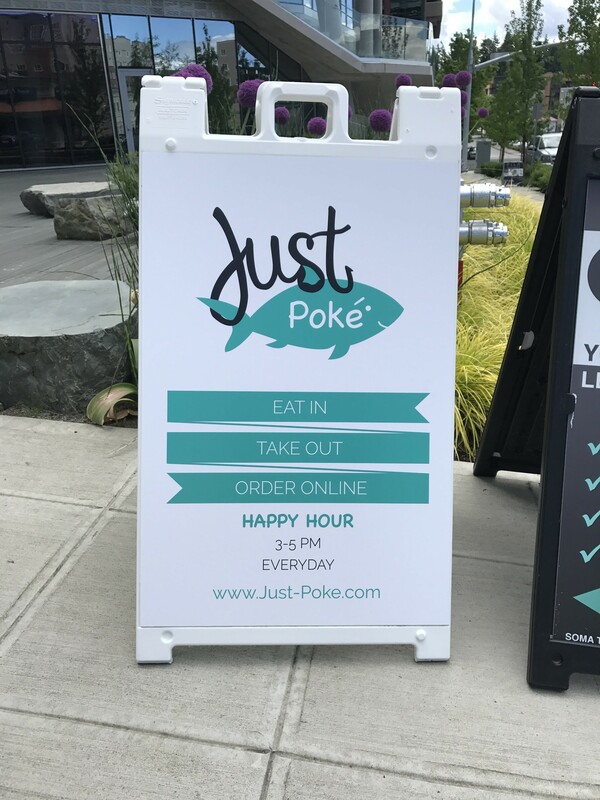 The team at Just Poke came to me to create a brand that was fresh and unique to the Seattle area. The creation of the brand consisted of a logo, signage, menu boards, etc. Sage Sessions are one day events hosted by Sage in various cities around the world for Sage customers and business partners. Sage Sessions 2017 events were a way to disseminate content and training from Sage Summit 2016 event in Chicago to a broader audience. We started with design inspiration from Sage Summit 2016 that used a starburst and a few angels from the starburst and created a new look that drew from the larger event, but was more in line with our newly launched updated identity and suitable to a smaller audience. 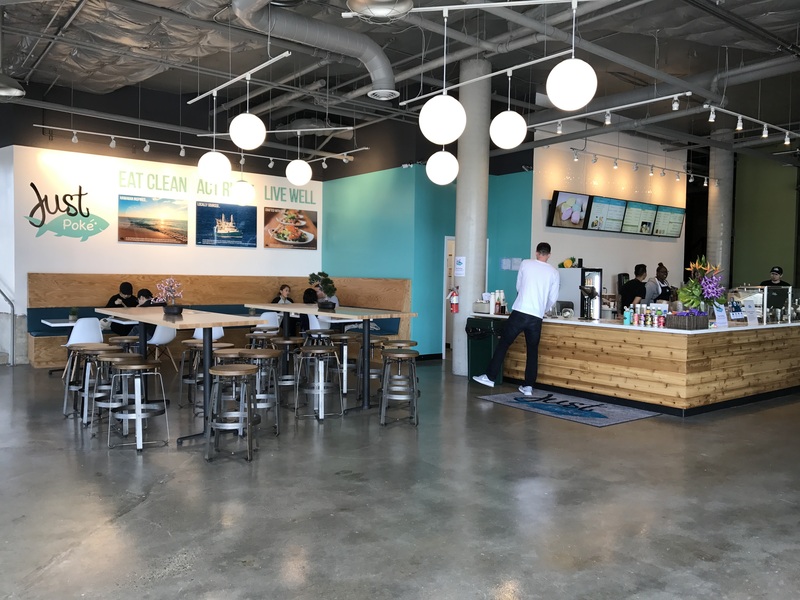 The design was carried through booths/stands, signage, emails, and digital banners. The cloud booth is the centerpiece of the entire show floor, bringing together all the design elements of Sage Sessions. In the backdrop, we utilized the angle cut to frame dynamic, authentic photography featuring different customers using the cloud. We also designed pods where demos happen, inviting people to take tours of specific products. 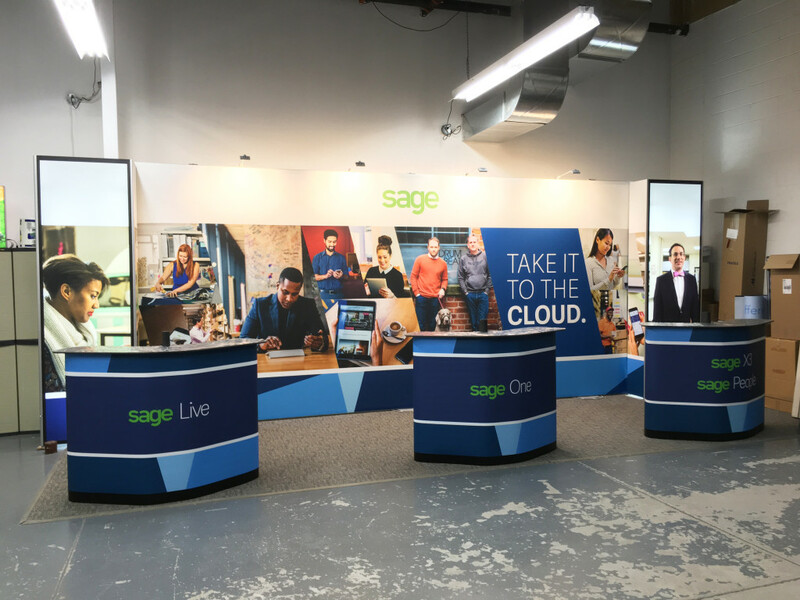 The cloud booth traveled to all Sage Sessions events across Canada. 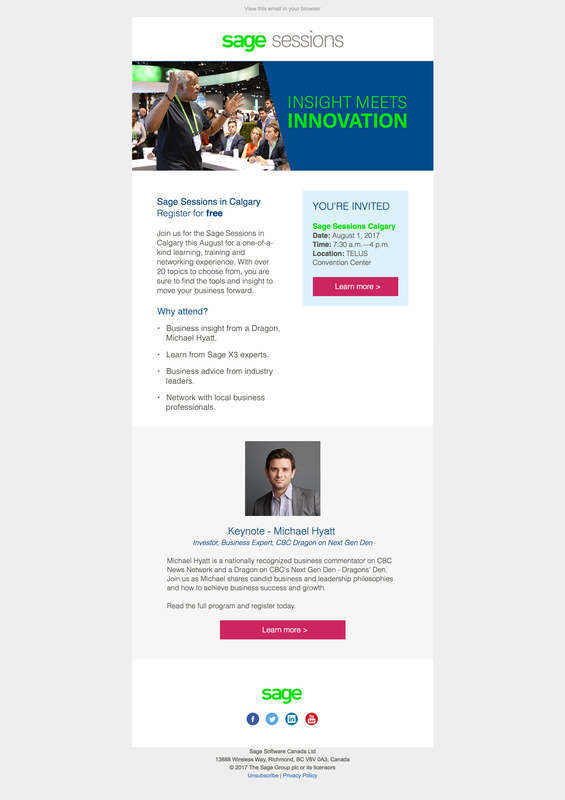 We created a template for audience generation emails that would be leveraged for each Sage Sessions event. 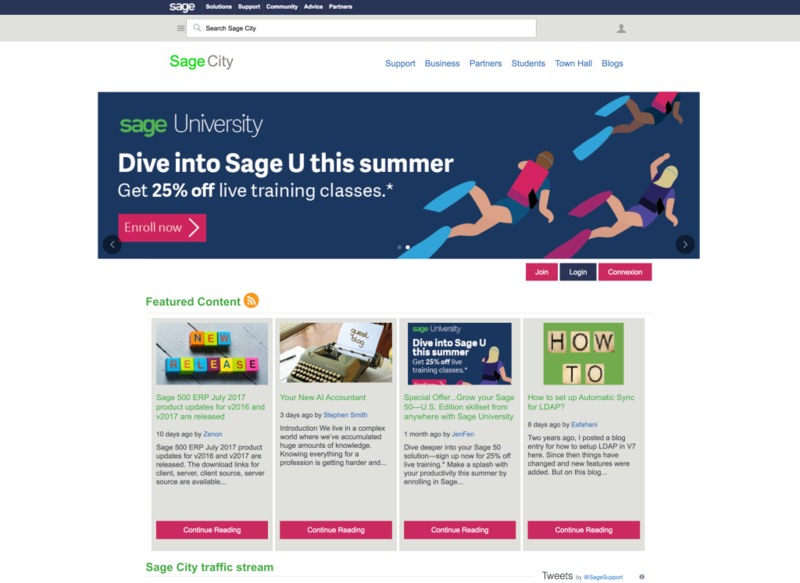 The header image pushes brand practices further with the angle cut, repurposed from the chevron design of Sage Summit 2016, by making the design less restrictive and easier to use across assets. We use authentic photography of customers and speakers from previous sessions. The modules below the header image have been tested and proven for best engagement. 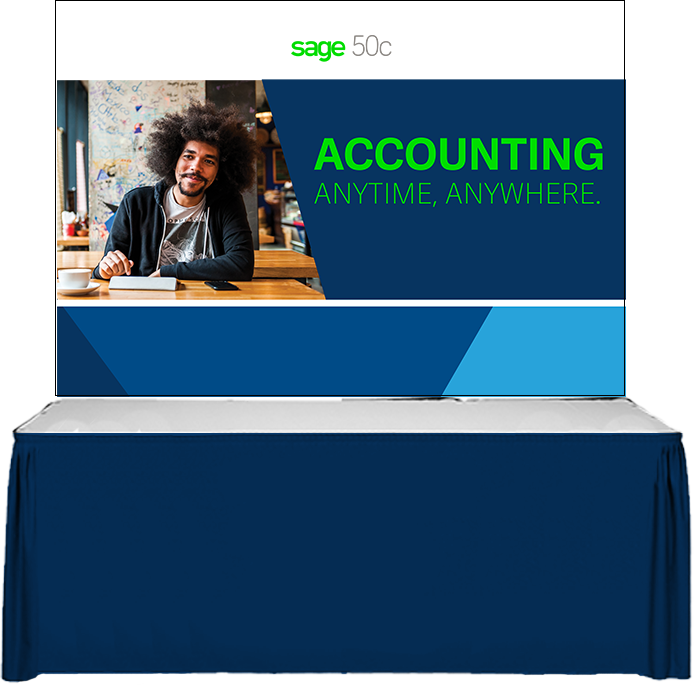 Booths were placed around the show floor to demonstrate and advertise various Sage products. We used the angle cut design in a fashion similar to the email headers, featuring authentic photography and making it easy to switch out photos and high level headlines across the show floor. We positioned the backdrop in such a way that it wouldn’t be blocked and could effectively advertise the product. 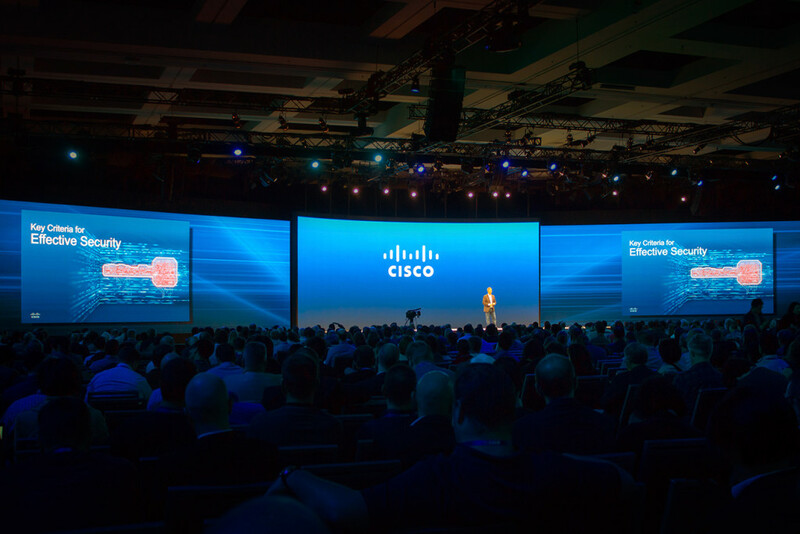 Apart of the Decca team that developed this keynote presentation for Martin Roesch, VP and Chief Architect for Cisco Security Business Group, for RSA’s annual conference. 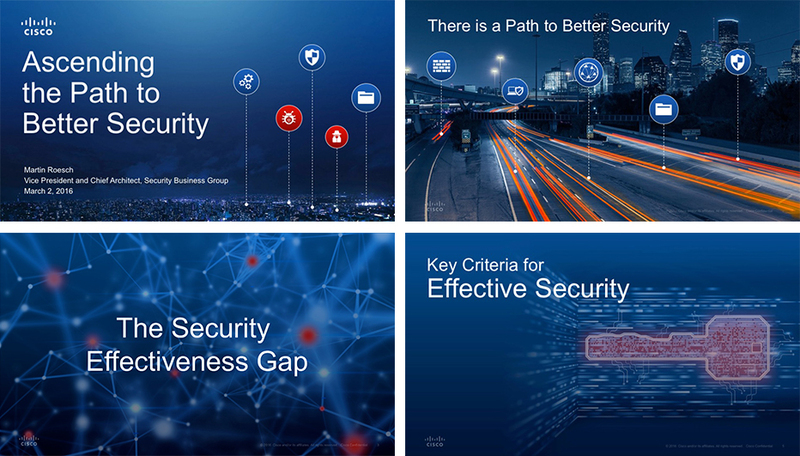 The attention-getting graphics help to visually tell the story of protecting organizations from a multitude of security threats.